Lincoln William "Link" Wasem (January 30, 1911 – March 6, 1979) was a Major League Baseball player. Wasem played for the Boston Bees in 1937. He batted and threw right-handed. He was born in Birmingham, Ohio and died in South Laguna, California. Birmingham is an unincorporated community in eastern Florence Township, Erie County, Ohio, United States. It is part of the Sandusky Metropolitan Statistical Area. Although Birmingham is unincorporated, it has a post office, with the ZIP code of 44816. It is located at the intersection of State Routes 60 and 113. This biographical article relating to a United States baseball catcher born in the 1910s is a stub. You can help Wikipedia by expanding it. Henry Louis Aaron, nicknamed "Hammer" or "Hammerin' Hank", is a retired American Major League Baseball (MLB) right fielder who serves as the senior vice president of the Atlanta Braves. He played 21 seasons for the Milwaukee/Atlanta Braves in the National League (NL) and two seasons for the Milwaukee Brewers in the American League (AL), from 1954 through 1976. Aaron held the MLB record for career home runs for 33 years, and he still holds several MLB offensive records. He hit 24 or more home runs every year from 1955 through 1973, and is one of only two players to hit 30 or more home runs in a season at least fifteen times. In 1999, The Sporting News ranked Aaron fifth on its "100 Greatest Baseball Players" list. Mark David McGwire, nicknamed Big Mac, is an American former professional baseball first baseman. His Major League Baseball (MLB) playing career spanned from 1986 to 2001 while playing for the Oakland Athletics and the St. Louis Cardinals, winning one World Series championship each with Oakland as a player in 1989 and with St. Louis as a coach in 2011. One of the most prolific home run hitters in baseball history, McGwire holds the major league career record for at bats per home run ratio (10.6), and is the former record holder for both home runs in a single season and home runs hit by rookie. He ranks 11th all time in home runs with 583, and led the major leagues in home runs in five different seasons, while establishing the major league record for home runs hit in a four-season period from 1996−1999 with 245. 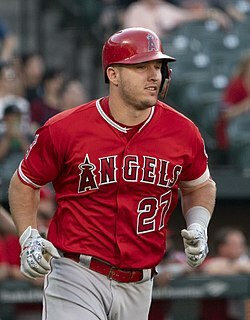 Further, he demonstrated exemplary patience as a batter, producing a career .394 on-base percentage (OBP) and twice leading the major leagues in bases on balls. Injuries cut short the manifestation of even greater potential as he reached 140 games played in just eight of 16 total seasons. A right-handed batter and thrower, McGwire stood 6 feet 5 inches (1.96 m) tall and weighed 245 pounds (111 kg) during his playing career. Theodore Samuel Williams was an American professional baseball player and manager. He played his entire 19-year Major League Baseball (MLB) career as a left fielder for the Boston Red Sox from 1939 to 1960; his career was interrupted only by mandatory military service during World War II and the Korean War. Nicknamed "The Kid," "The Splendid Splinter," "Teddy Ballgame," and "The Thumper," Williams is regarded as one of the greatest players in baseball history. Williams was a nineteen-time All-Star, a two-time recipient of the American League (AL) Most Valuable Player Award, a six-time AL batting champion, and a two-time Triple Crown winner. He finished his playing career with a .344 batting average, 521 home runs, and a .482 on-base percentage, the highest of all time. His career batting average is the highest of any MLB player whose career was played primarily in the live-ball era, and ranks tied for 7th all-time. Harold Joseph "Pie" Traynor was an American professional baseball player, manager, scout and radio broadcaster. He played his entire Major League Baseball (MLB) career (1920–37) as a third baseman with the Pittsburgh Pirates. He was inducted into the Baseball Hall of Fame in 1948. Howard Earl Averill was an American player in Major League Baseball (MLB) who was a center fielder from 1929 to 1941. He was a six-time All-Star (1933–38) and was elected to the Baseball Hall of Fame in 1975. Jesse Cail Burkett, nicknamed "Crab", was an American left fielder in Major League Baseball from 1890 to 1905. He batted over .400 twice. After his playing career, Burkett managed in the minor leagues. He was elected into the Baseball Hall of Fame in 1946. Iván Rodríguez Torres, nicknamed "Pudge", is a former Major League Baseball catcher. He played for the Texas Rangers, Florida Marlins, Detroit Tigers, New York Yankees, Houston Astros and Washington Nationals. Billy Leo Williams is a retired American baseball left fielder who played sixteen seasons in Major League Baseball (MLB) for the Chicago Cubs and two seasons for the Oakland Athletics. Williams was inducted into the National Baseball Hall of Fame in 1987. In 1999, he was named a finalist for the Major League Baseball All-Century Team. Raymond Otis Boone was an American Major League Baseball player. He batted and threw right-handed. Darrell Wayne Evans is a former third baseman and first baseman in Major League Baseball who played from 1969 to 1989 with the Atlanta Braves, San Francisco Giants (1976–83) and Detroit Tigers (1984–88). He is also the former manager and director of player personnel for the Victoria Seals of the Golden Baseball League. Lawrence Patrick David Gillick is an American professional baseball executive. He previously served as the general manager of four MLB teams: the Toronto Blue Jays (1978–94), Baltimore Orioles (1996–98), Seattle Mariners (2000–03), and Philadelphia Phillies (2006–08). He guided the Blue Jays to World Series championships in 1992 and 1993, and later with the Phillies in 2008. Richard Eugene Manning is a former center fielder and current broadcaster in Major League Baseball (MLB), who played for the Cleveland Indians (1975-1983) and Milwaukee Brewers (1983–1987), and has been a color commentator for Cleveland Indians telecasts since 1990. Dennis Patrick Leonard is a former pitcher for the Kansas City Royals in the late 1970s and early 1980s. He retired in 1986 due to injuries. Bruce W. Wasem is a former American football and baseball coach. He served as head football coach at the University of Virginia's College at Wise for eight seasons, from 2002 until 2010, compiling a record of 48–52. He helped start the program in 1991. For the 2006 season, he was awarded conference coach of the year and the team was given the NAIA Champions of Character award. He previously was the head baseball coach and assistant football coach for Wilmington College in Wilmington, Ohio.